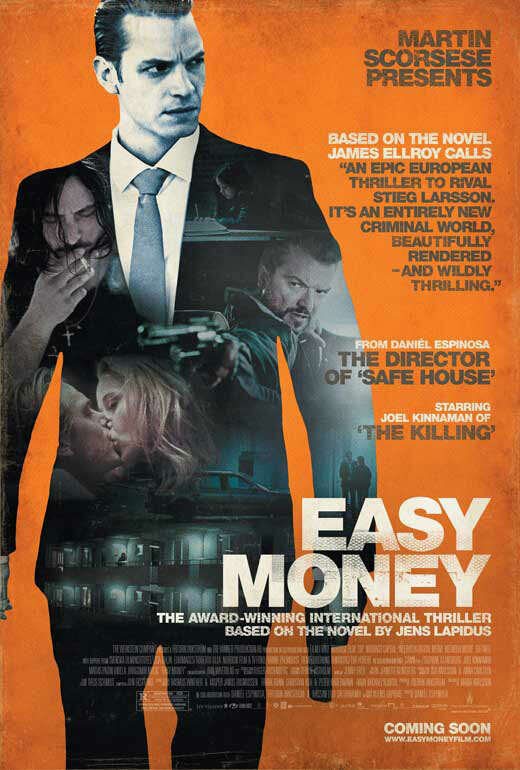 Though the film seems to be getting fairly positive reviews, Daniel Espinosa’s Easy Money is just another crime drama that follows all the clichés and does nothing new. The film, set in Stockhold, follows a college student named JW (Joel Kinnaman) who idolizes his wealthy classmates. JW starts driving a taxi illegally for a local mob boss to make money on the side and begins socializing with some of the wealthy classmates, pretending to also be a part of the upper class lifestyle. One day at a party he meets Sophie, (Lisa Henni) the girlfriend of the boy who is throwing the party, and the two begin a romance that pushes JW to ask crime boss Abdulkarim (Mahmut Suvakci) for opportunities to get more money. From there JW gets sucked deeper and deeper into the inescapable rabbit hole of crime. The film also follows a hit man named Mrado (Dragomir Mrsic) who works for a rival mob boss and acts as a foil to the JW character. Mrado is older, has a daughter to look after, and decides he can’t be putting his daughter and himself at risk any longer. The story weaves between the two and a third character named Jorge who one gang is after and the other is trying to protect, but at the same time attempts to make JW the center of the story. Unfortunately it doesn’t work and instead of adding anything to the story it just comes off as convoluted in an attempt to appear like a complex, intricately woven story. It is not. The story is based off a book by Jens Lapidus, a Swedish criminal defense lawyer, and is the first part of his Stockholm Noir Trilogy (Part two has already been completed). Director Daniel Espinosa made his American film debut just a few months ago with the Denzel Washington/Ryan Reynolds thriller Safe House but surprisingly this movie was completed two years ago and is only just now getting an American Release, making it his true directorial debut. For some reason or another the Weinstien company bid on his film after if premiered at the Berlin Film Festival back in 2010 but decided to wait to release it until now. Whether it is because they wanted to wait for Espinosa to gain some name recognition with the release of Safe House, or because they hoped that Joel Kinnaman would be more famous by now and not only known as that guy playing the new Robocop and the terrible actor in the terrible film The Darkest Hour is unclear to me. Another possible reason is that they realized this film was just another crime movie with mediocre acting, a script that drags on, and a director who really doesn’t seem to be all that talented. Whatever the reason is, the film is finally coming out now in the US while the sequel is already completed and ready for distribution too. Easy Money opens today at the Ritz at the Bourse.